Poem written by John Milton (1673). When I consider how my light is spent is a sonnet written by John Milton about his blindness. 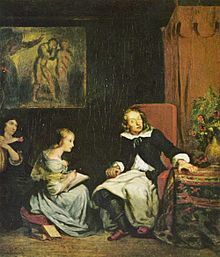 The poem possess characteristic features of a classic sonnet – it has 14 lines and it builds up an argument that changes halfway through the poem after a break (when he questions “Doth God exact day-labour, light denied?”). In the first half, he is slightly bitter about God depriving him of his sight and the worthless feeling he experiences when he is not able to serve his ‘Maker’ as he wishes to. Towards the end of the sonnet, he becomes more patient, learns to see ‘things in a different light’ and accepts his blindness. John Milton (1608-1674) was an English poet, he is still known to be one of the greatest English writers in Literature. Milton used to write poems by dictating to his amanuenses* after he lost his sight (the cause of which remains unknown to us but it’s believed to have been either, a case of untreated glaucoma or bilateral retinal detachment). Milton was born into an interesting time where several movements and wars were brewing. He must have seen life through a unique pair of lens and legend has it that he got a chance to meet Galileo Galilei. He also studied in the same school where the eminent metaphysical poet John Donne was a Dean from 1621 – 1631. *amanuenses – a literary or artistic assistant, in particular one who takes dictation or copies manuscripts. Featured image – John Milton Dictates the Lost Paradise to His Three Daughters, ca. 1826, by Eugène Delacroix, Current location – Williamstown (Massachusetts)/ Sammlung G.H. Hamilton, Wikimedia commons. Our dignity is not in what we do but in who we are.